This one is now in the bottle. I originally wrote about it here; essentially it's a beer inspired by a sandwich, what more could you ask for? The brewday went well ... until my boiler tap blew and I ended up with 80c wort all over the floor. I managed to save the vast majority of the batch though and eventually got it cool enough to pitch the yeast. I've never used rye malt before but didn't experience any of the reported problems with sticky mashes. The beer took a long time to drop bright in secondary and had some really harsh sulphur smells coming off it early on during fermentation. These points aside everything was fairly normal, I left it in primary for ten days then racked to secondary. Five days after racking to secondary I hit it with the toasted caraway seeds and left them to infuse for a week. Vital statistics are: OG 1054, IBUs 45, FG 1008, ABV 6.3%, EBCs 23. Breaking open a test sample, I was pretty happy with the result. The fruity, spicy rye is there in the background but the dominant character is a big hit of the caraway seed. It's unusual and different but I think it works, the bitterness is bold and really helps to clear your palate of the imposing caraway. At 6.3% I think it'll get better with time ... I'm looking forward to trying this again in a couple of weeks. It's odd but I think people will enjoy it. As an aside: I love the idea of an indigenous yeast being used to make a local beer (in the truest sense). I've been playing around a lot lately trying to capture and cultivate wild yeasts and I've had some success. More about all of this a little later on. Anyway, whilst bottling the rye beer I had some spare wild yeast starter to hand, so for the sake of experimentation I may or may not have seeded a couple of bottles with a London Brett/Lacto mix. Surely the worlds first Brett'd, Soured, Rye and Caraway beer? There's literally only two 33's of it ... so I'll save it for a beer night when a few people can enjoy it. The picture above is of a blank bottle because I don't have a name for this one yet. I was thinking of something along the lines of "NYD" (New York Deli). If you've got a better idea ... hit me. 80c wort. Ouch, that burns. Similar thing happened to me a few years back an got second degree burns to my foot. Blimey ... nothing worse than a bit of lost beer for me, thankfully managed to avoid any burns. It's the first of two tap blows I've had in a row though ... and my element just blew too. Not having the best of luck kit-wise. Interesting stuff, be keen to hear how it ages (& what the brett/lacto soured version is like!). Will definetly post a blog when the lacto/brett version is cracked open. These things take a long time, so it might pay to save one of the two for a while. I didn't know that ... no! :P That's a random piece of trivia to have logged away! I myself, while talking with a friend, just came upon the idea of using caraway in a rye beer. I'm curious---how much caraway did you use at the end of boil and in the secondary? I hope you don't mind sharing a bit of info. Not all I, happy to share. I didn't use any in the boil, I added it all in secondary as you would for dry hops. I added 5g and left it for 5 days then added a further 6g and left it for 2 more days. That was in about 12-15 litres (can't remember exactly). I would suggest adding a bit less than that though, the caraway flavour/aroma in my version was huge! Did you bottle condition the beer or keg? If you bottle carbonated, did you end up having problems with the caraway killing yeast and inhibiting proper carbonation? Bottled conditioned. 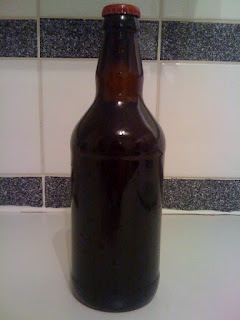 I primed with 1/4 a tsp per 330ml bottle and 1/2 a tsp per 500ml bottle and havent had any issues at all with carbonation.